Welcome to the exciting world of Soft1 Series 5, the next step of Soft1 software that incorporates more than 200 improvements and great new features that enable users to get more done, more quickly and easily, with less mouse clicks and keystrokes, making the everyday using experience more powerful and delightful. Soft1 Series 5 offers an unprecedented experience that directly impacts organizational productivity and performance. In Soft1 Series 5, the application’s work screen and main menu have been redesigned. The menu is simplified, consisting of seven basic sections that make it easier and more intuitive to switch between tasks instantly. Soft1 Series 5 additionally features a new set of typeface with improved spacing, resulting in great legibility. The foreground and background color ratio has been optimized and the layout of graphical components is simplified and repositioned, making it compelling and extremely functional as it maximizes the data viewing space. The overall graphical environment is as impressive as the ease to design personalized gadgets of any form and content (data, browser, HTML etc.). 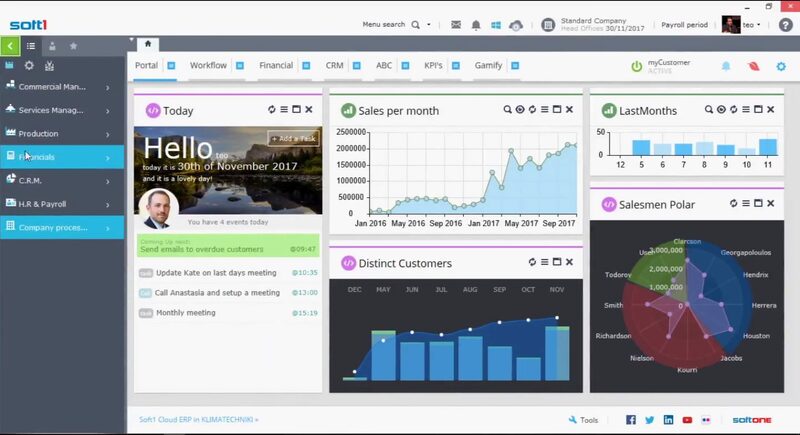 At the top of the screen, the new toolbar provides the user with a comprehensive view of the application environment, portraying pending messages and reminders (just like a social media platform), as well as providing access to the most essential tasks such as system settings, SQL status monitor and installation information. In the Soft1 Series 5 applications, any screen form, including all filter screens, are scrollable. This allows even more information to be fitted into any screen, regardless of screen dimension and resolution. Selecting vertical scrolling and literally without any restriction, the user can access any type of screen form, with as many fields desired. As a result, screen forms are instantly adjusted to larger or smaller screens without any drawback, allowing the users to navigate with less scrolling and clicks. Accessing the modules and applying filters or displaying browsers, has always been easy in Soft1 applications. Given that the application screens extend horizontally, designing browsers, screens, alerts and import scenarios, has been placed on a floating side menu, which is more powerful way to work. The new side bar is a fundamental addition in Soft1 ERP. Available from any screen, with a simple mouse over you can reveal and switch between the most common tasks, related jobs, browsers and screen forms, instantly. Docking quick views standardize and speed up the workflow of users handling daily loads of operating data. It is a versatile and powerful tool for organizing and accessing additional information in a structured manner, on any type of screen form. 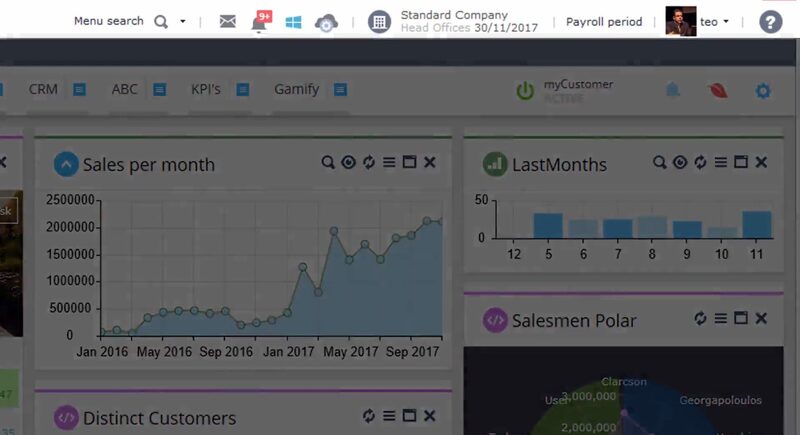 A quick view can be called out with a simple right click or integrated into any screen, offering users a whole range of options on accessing detailed information such as credit control data, stock balances, customer financial overview, order history etc. The users can access in one place, in the simplest manner, all transactions relating to any transaction at any given time. 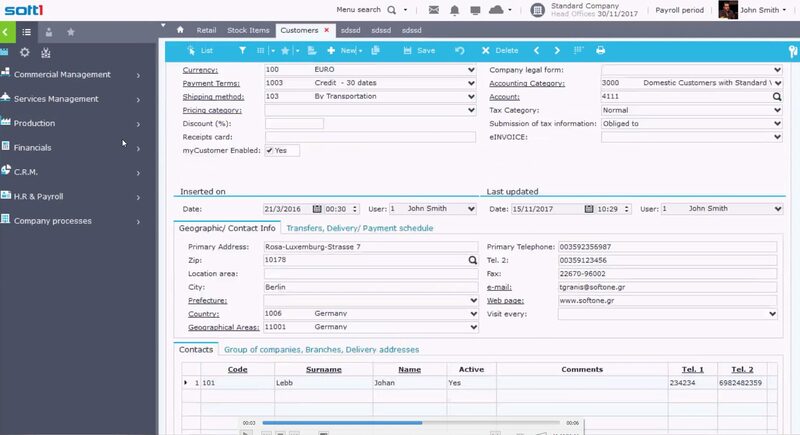 In any major sections such as projects, trading parties, installations, actions, tasks and employees, a new tree-like timeline is available as a chronological album that graphically illustrates all relating transactions such as orders, invoices, receipts, payments and any other action that has occurred over time. In Soft1 Series 5, all browsers and data lists, besides the vertical grouping, they now feature a horizontal grouping option with a drill-down access to records, just as in pivot tables. In addition, each data column includes a dynamic filter, which is a quick and easy way to work with a subset of data. When using multiple filters, at the bottom of the screen, there is summary of all the applied filters, along with an option to proceed in creating more complex scenarios. Naturally, all scenarios can be saved for future reference. 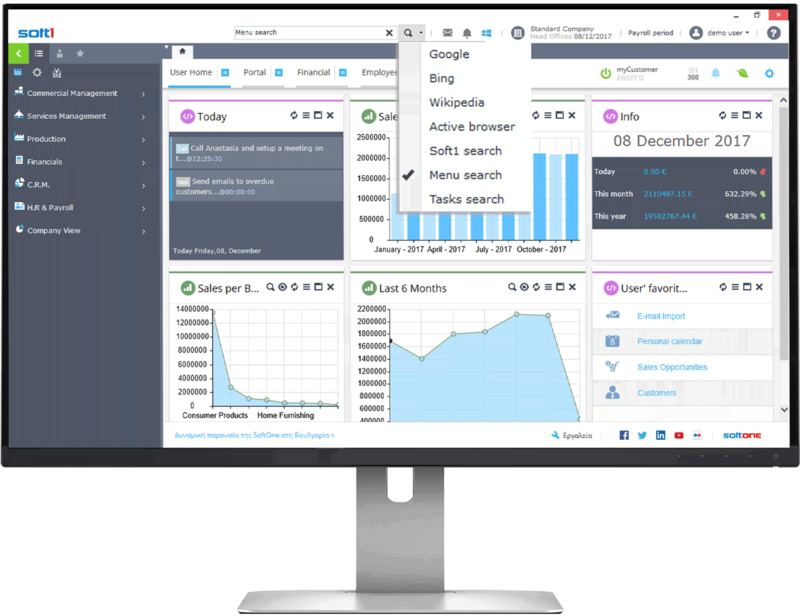 Soft1 Series 5 features powerful multi-criteria search functionalities within any menu, task, action, active browser etc. Acting just like a full-text search engine, the new search bar automatically adapts its focus to the active task, menu or related action, without requiring any additional user intervention. In addition, in Soft1 Series 5, you can perform more precise searches on particular fields such as grids and combo boxes. One of the key characteristics, in Soft1 Series 5, is the flexibility to create or modify any type of forms in real-time. The time needed to apply changes on any screen form, has be reduced in half and all the changes and modification do take place on the fly, without requiring to restart the entity. Please, fill in the following form. In the email address you will provide, you will receive the necessary information to activate and use the application. There was a technical error while submitting your form.